To provide opportunities for networking among professionals from varied services/disciplines. To educate members on issues concerning older adults through professional conferences featuring a speaker and networking with others regarding available services. To share common concerns or views on current issues facing older adults. The mission of the Geriatric Interest Network of the Blair County Region is to maximize the community’s awareness of services for older adults and informal caregivers of the region by providing a forum for professional networking among service providers and to enhance the quality of services for older adults in the region. 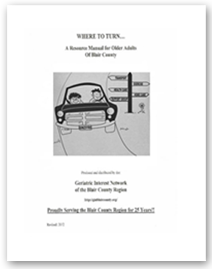 The Geriatric Interest Network of the Blair County Region is a freestanding organization of providers of diverse geriatric services or products. The Network assumes a leadership role through the provision of regular forums, which offer opportunities for: education, informal support, networking, advocacy, sharing concerns, and resource integration.